I've been following, and occasionally joining in, a series of threads by Willis Eschenbach at WUWT. Here is the latest, and you can follow links back. Willis is trying to detect periodicity in various segments (century or so) of monthly or annual data. Lately he has been trying to decide whether sunspot (SSN) periodicities can be observed in climate data. This involves first establishing the major periodicities in SSN, and then looking at periodicities in signals which might be responding. In the early part, Willis was fitting sinusoids using a least squares fit by optimisation. In this comment, I showed that the quadratic form could be expressed as a fairly orthodox discrete Fourier Transform expression, and wrote code to show how the same result could be derived. Willis then recharacterised what he was doing as a Slow Fourier Transform; here I try to put that in context. I was not, BTW trying to suggest that what Willis was doing was wrong; only to say that it could be done more efficiently by FFT methods (which involved padding), and there was a long history. In fact someone characterised it as a Lomb periodogram, and it is certainly of a class of Least-squares spectral analysis (LSSA). In the most recent version, he is using regression of the data onto sinusoids, and investigating the effect of using monthly or annual time divisions. Tamino chimed in in a positive spirit (the thread was called "Well, Color Me Gobsmacked! "), and said the method was known as the Date-Compensated Discrete Fourier Transform. I think Willis now regards the chief advantage of the method as allowing for irregularly spaced data, in his case missing months, and that is what the DCDFT is for. The method is sometimes being criticised as not being a truly orthogonal decomposition. I think that is misplaced. You can look for periodicities in a Fourier decomposition, but it is not the only way. I think Willis is basically filtering. He creates the equivalent of a perfectly tuned circuit, which takes the data as input, and identifies the amplitude of the response as the measure of periodicity. I think that is fine, and so I'd like in this post to say how one might assess and maybe improve the merit of that measure. It's like what you did with the old AM radio receiver. By frequency shifting with a knob, you listened to the sound level to find stations. What I want to do in this post is to show how you can get past all the issues of missing data and orthogonality, and rephrase in terms of Fourier integrals, which exposes the sources of error. I'm expanding on this comment. For any given frequency ω, Willis uses the R lm() function to fit a+b*cos(ωt)+c*sin(ωt). He then returns √(b²+c²) as the amplitude of the fitted sinusoid. He usually plots this against period, not frequency, and looks for peaks. This is a linear filter on the input. Normally we think of a filter as modifying one time series to another. This is a perfectly tuned filter, in that it produces a pure sinusoid as output. That is rather boring, in that it can be characterised by two numbers, amplitude and phase, and Willis drops the phase. But it is still a filter. You can think of it as a tuned circuit (or bell or cavity etc) which responds to frequencies near its resonance. I'll assume that the data represents samples from a continuous function f(t). This assumption is basic to any continuum analysis. You have to assume that the data you have is representative of the values in between. f(t) could, for example, be a linear interpolate. ω is angular frequency, θ phase. All integrals here are from -∞ to ∞, but Ψ(t) is sum of a finite number of delta functions. I've chosen Ψ to suggest a shah (Ш) function, also called a Dirac comb of delta functions. Generally it will here be mostly equally spaced, but that is not a requirement. It is truncated. I think this shows a number of things. There is a peak at 1/10 yr-1. It has side lobes, which represent the effect of the finite (200 yr) interval. These affect the ability to discriminate peaks. It is actually periodic overall, with period 0.5 yr-1 (the FT alternates in sign and has period 1 yr-1). 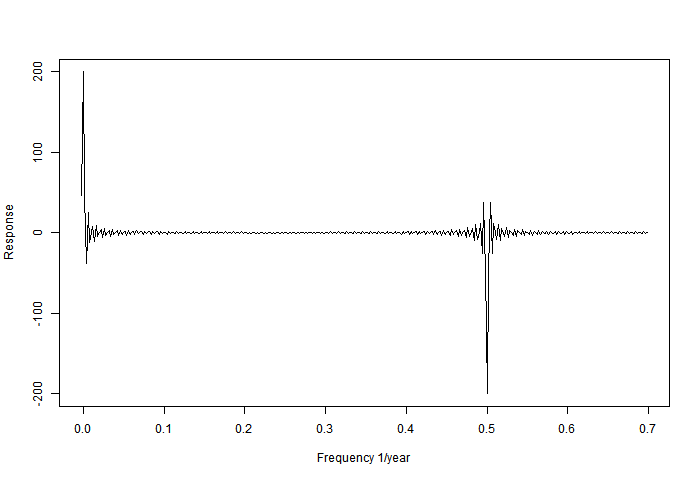 That shows problems when you get up to the Nyquist frequency. But the peaks are fairly sharp, and the Nyquist troubles far away, at least if you are looking at periods of 10 years or so. The sinc function ratio is actually the sum of sinusoids evaluated at the sample points. You can evaluate at a set less regularly spaced, with missing values say, and the function won't be radically different. And of course, the method still works. In recent discussion, I've put some other analogies. The method is actually like the way analogue spectral analysis was done. Tuned circuits, acting as filters, responded to the signals in a tuned way. If you aren't familiar with circuits, think of a bank of lossless tuning forks, mounted on a sounding board, say. You buzz the burst of signal, and see which ones pick up the most energy. The mathematics of the regression Willis uses is in fact the math of heterodyning. You multiply by a sinusoid and add. If the signal can reasonably be fitted with a nearby sinusoid, then the trig formula for products will yiekd a beat frequency, lower in pitch as the two frequencies are closer. The addition is a low pass filter, passing with amplitude inversely proportional to frequency. So its response is approximately proportional to both the strength of the periodic component, and to its closeness. I'll stop here for the moment. I'd like to deal with the effect of annual averaging, which fits in nicely, and was one of Willis' topics. I'd also like to deal with the effect of windowing, with the idea of making the side lobes diminish faster. I think it will help, but the current situation isn't bad. This is a followup to my two previous posts (here, and here). 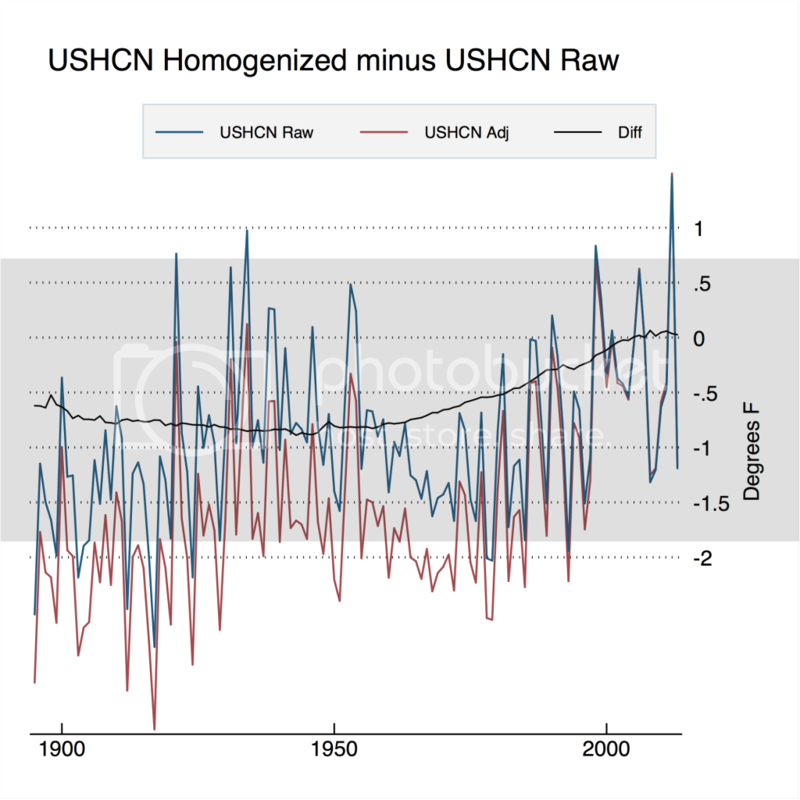 In the last, it was shown that in comparing two different USHCN sets (raw and final) a spike in 2014 was due to the data coming from different periods. 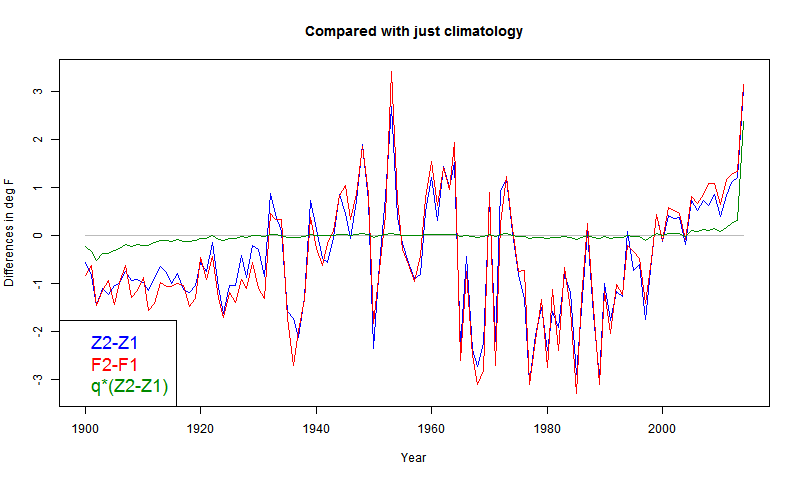 The spike was there even if the climatology was substituted; so it wasn't a result of actual 2014 readings, only when and where they happened. Now I'd like to draw some lessons from that in terms of anomalies. How anomalies remove the spike. How this might be improved. Averaging is linear, and you can think of it as applied to the sum of an expected value (climatology) and an anomaly (the information part). If the expected value is subtracted, the cause of the spike goes away. Put another way, if the expected value is near zero, it won't matter much if the station/months in the samples vary. Let's see how that works. For each station/month, I'll subtract the longterm annual raw average. That is, from a May reading, I'll subtract the May average. Here are the equivalents of R1, F1 and SG from the previous posts. It corresponds to this plot from the previous post; 2014 has no spike and has not been omitted. You can see that it is broadly similar except for the offset. But now F2 (the average of unmatched final data) is far less out of line, and so the mauve SG (average of all final) is very close to F1 (average of matched final). SG's method, mine all give much the same. In this post I showed how for a fixed grid with empty cells, you could say that averaging with missing values and averaging with missings infilled with the average of what was there gave the same result. This is true for subset averaging. If you average first over latitude bands, it's equivalent to infilling with the subset average. That gives a criterion; the averaging should be done so that the infill is closest to your expected value. So latitude band averaging is better, because there is a systematic latitude effect on trend. When comparing two different sets, with no natural set of slots for data, missing means unmatched. If there are station/months in one average but not the other, the latter can be treated as missing, and considered infilled by average. You could try to improve with explicit infill. 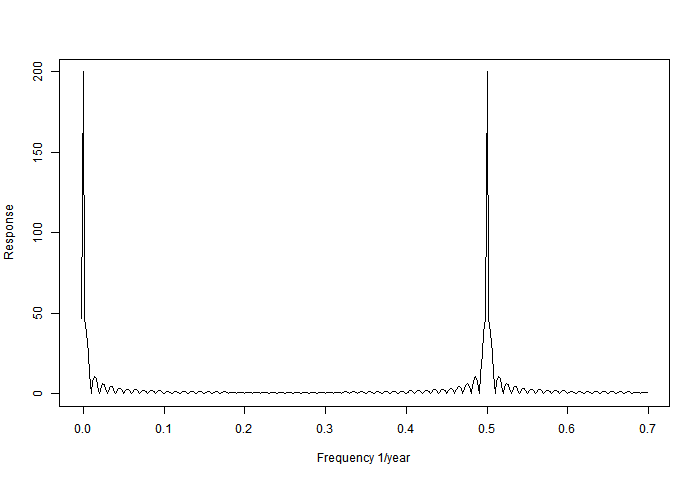 But if you have a time series plot, say, the missings between any pair are different. So explicit infill won't work. But you can offset so that each average is of points with as near as possible zero expected value. Then the default infill is near zero. That's the anomaly approach. These are compiled from a scatter of stations with very different reporting periods. These are conventionally assembled into grid cells, anomalised and the cell averages averaged. This compensates for variations in station density. But if the cells are small enough to give good resolution, then many will be empty. 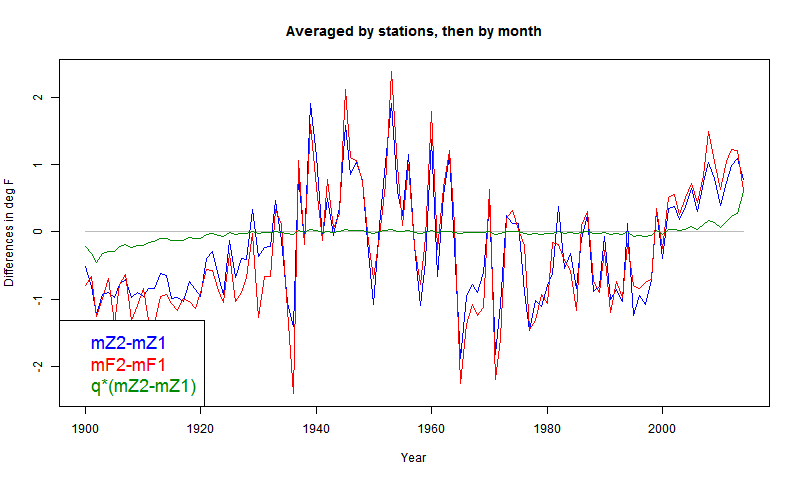 It is also possible to make station anomalies directly by subtracting long term month averages. Then some suitable spatial integration formula is needed. 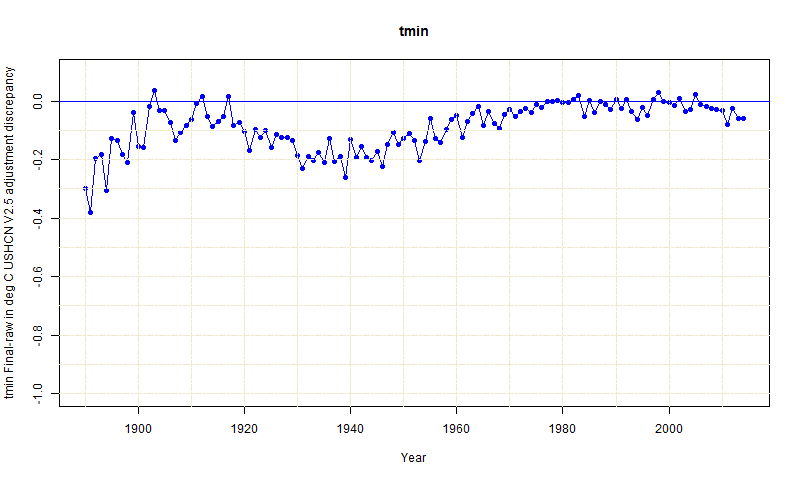 The inter-set comparison logic is needed just to make the time series coherent - you can compare any pair of years and know they are on the same basis. You aren't seeing big differences because stations drop in or out. A famous example where this didn't work so well was the Marcott spike. You can extend the concept of missing data to cover all points that aren't sampled. Again there is implicit infill. You can see this in two ways. The quadrature formula brings weights, so it's equivalent to infilling with a weighted average. Alternatively, the quadrature is based on forming and integrating a local interpolate. These two ways should be consistent. I'd like to show the effects of various anomaly methods. First here is a shaded plot of absolute temperatures for US April 2014. This is unadjusted min/max average for GHCN stations (QCU). There is a strong latitude variation, which dominates the local variability due to altitude. The color scale is actually a cut-off fragment, and is also non-linear. But you can see how the average might vary depending on how evenly the stations sample the latitude zones. Now here is a shaded plot of individual US anomalies for April 2014, calculated just as differences from the long term mean of all April data. The latitude dependence is gone, but it is fairly blotchy, empohasised by the way the triangular mesh does shading. In these plots, the colors are correct for the actual stations, and linearly shaded in between. The blotchiness is partly due to the fact that some stations have long records, and so a fairly low average, because of the cooler past. Low average means high anomaly. Others have only recent data and a higher average. There is a catch. Using long term averages which are typically all available data removes variation in station climatology and seasonal monthly. But there may be a secular variation over years - probably a trend. You'd like to know what that is. However, it also means that the flat mean is not the best estimate. There will again be a bias in that stations whose anomaly mean is formed with more recent data will have a lower expected anomaly that those who don't, so again it matters what stations are in the mix. The standard remedy is to choose common base years, eg 1961-90, for each station/month base. 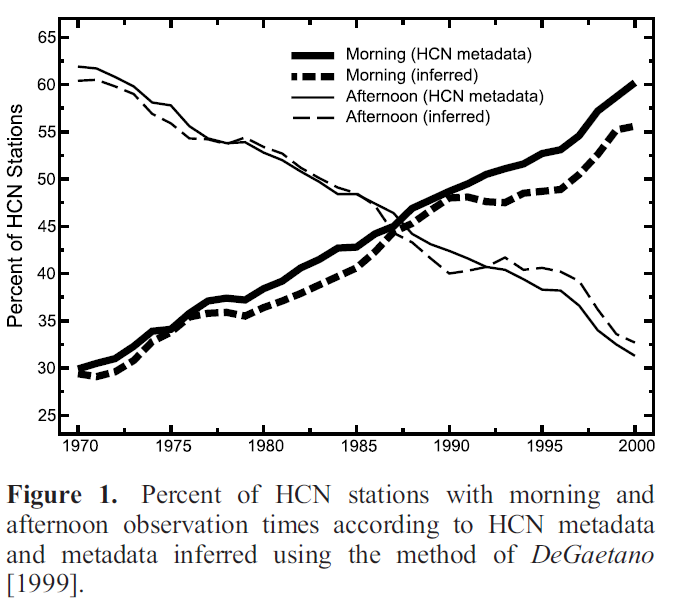 But then there is the problem of stations lacking data in the period. In the next plot, I've used a trick to overcome this. I've used an exponentially weighted linear trend fit. The weight is centred at 1975, and gives most weight to data in the range 1961-90, which is a common choice for anomaly base interval. I use the 1975 intercept. In that way I can get a reasonable estimate even if there is data missing in that interval. It won't work so well for stations that stopped long before, but they won't have 2014 values anyway. GHCN has few if any US stations that started post 1975. You might agree that it is better than averages taken at whatever time there is data; it takes out that variability. 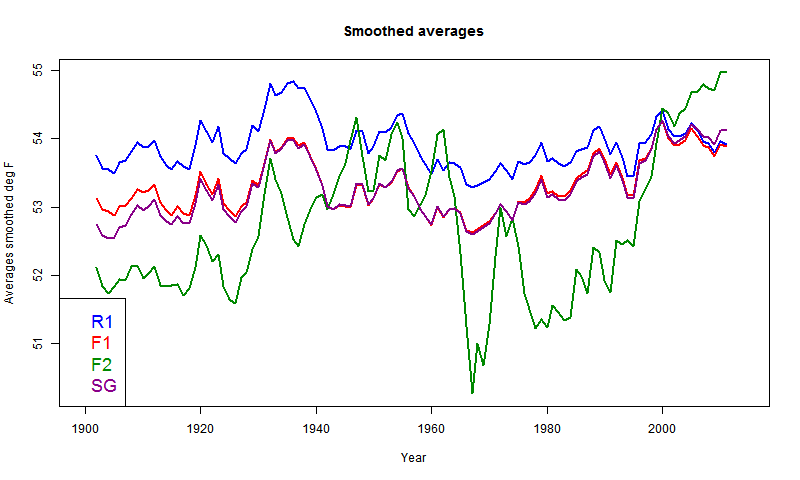 But it still has variability due to variation in trend since 1975. Another way is to detrend completely. That is the standard way of removing expected value. But the trend is wanted, so has to be recovered after averaging. The next plot shows the April 2014 plot where each station has been locally detrended, again with exponential weighting. You can see that as each element of expected value is taken out, over the succession of plots the map gets (slightly) smoother. Anomalies represent an attempt to romove as much as possible from a signal that is predictable, generally prior to averaging. 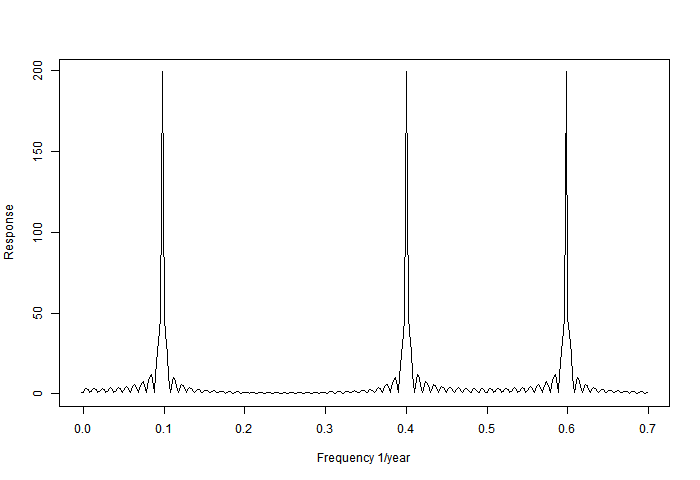 Since the residuals have much reduced mean, there is less sensitivity to variation of stations/months in the sample. Since the part removed reflects non-climate variations like topography, latitude and seasonality, the remainders have a better chance of showing whatever coherence there is in the information part. Hence the improving smoothness. It gives a better chance that the samples will reflect the measurand in between locations. There has been quite a kerfuffle about USHCN adjustments. There was a WUWT post on reasons for the spike, a recalc at Steven Goddard's site, and more here and here. But the basic elementary issue is little understood. You need to be very careful doing arithmetic with averages of data from disparate situations. I'll show why. 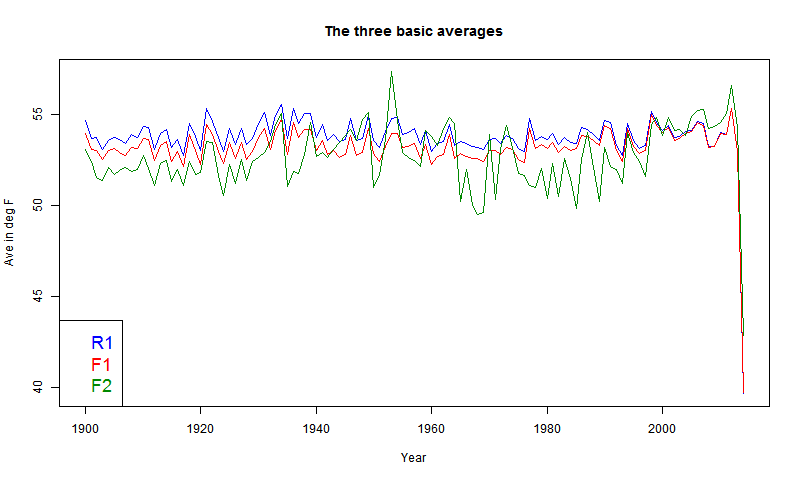 I introduce three annual averages. F1 and R1 are averages of Final and Raw USCHN data over just the set where both numbers are known. Then F2 is the average of Final, in each year, over data where the raw is not known. My earlier calculation was F1-R1, or equivalently, the average difference between final and raw when both are known. This is clearly a measure of adjustment. Steven Goddard's variants all include F2 in some way. I'll show that this is never helpful, and leads to silly results. In averaging USHCN data with adjustments, we have in each year a set S1 of N1 station/months that have both raw and final data, and a set S2 of N2 that have final alone. Call F1 and R1 the averages of final and raw on S1, and F2 the average of final on S2. 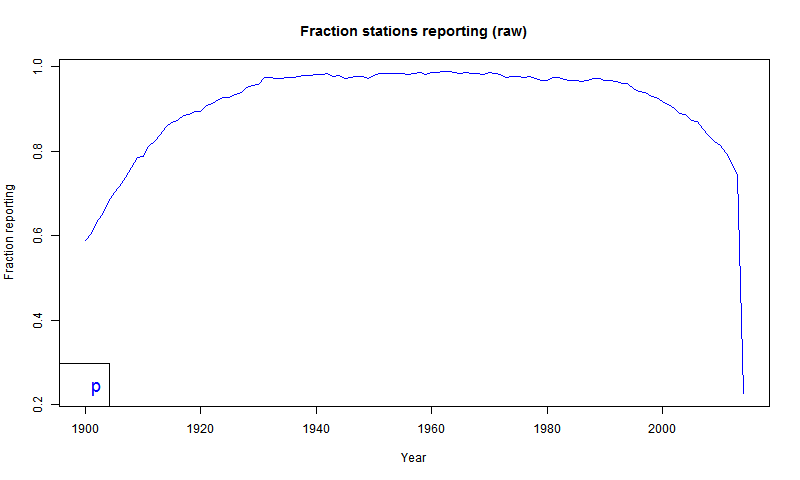 Caveat: I have started from 1900 from where it is almost true that all stations have final data. 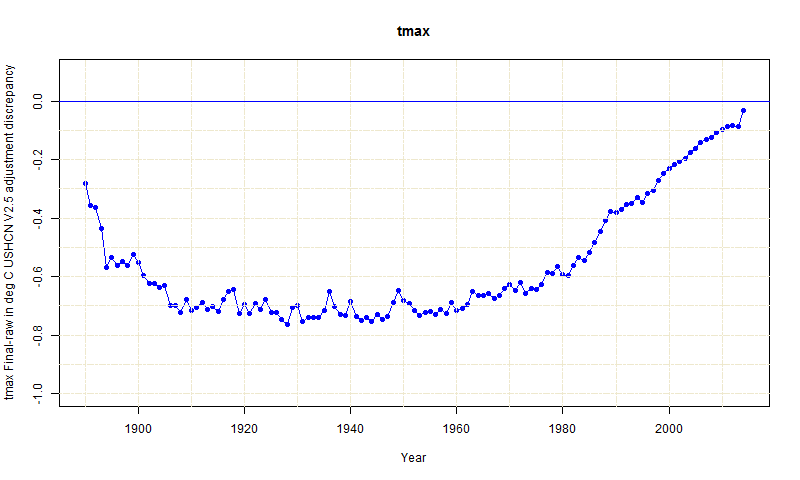 There are just a few (max 3) missing in some years of the first decade. I believe that makes no difference to the analysis. So A_N is indeed an average of known adjustment differences. SG has combined it with something else. What does that achieve? SG insists that it adds, or retains, information about the interpolation (F2). But we don't have a difference between interpolated and raw. Instead, he has combined it with F2-F1, which is the difference between two sets of final values. This really makes no sense. But it led to the "spike". The reason is that the interpolated points are more frequent in the latest month, April. And that is the warmest month. While R1 is on the complementary set, which is the cooler period. The small adjustment makes little difference here, compared to seasonal. 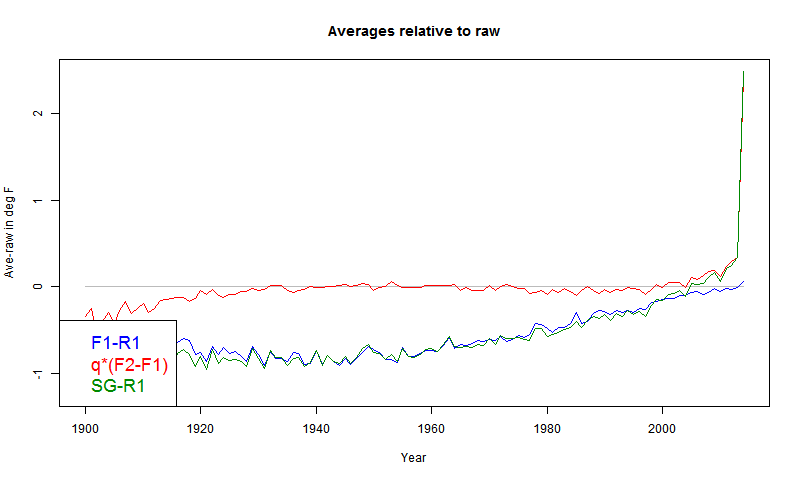 In fact, for recent years, raw and adjusted are virtually identical. The downspike in 2014 is due to being mostly winter so far; a caution of troubles to come with absolute temperatures. The next plot is smoothed (7 year MA) to compare with the SG plot here, where "Raw" is R1 and "Final" is A_S, which I've called SG (average of all final)SG. The "new method" there is averaging by months first which makes a big difference for 2014, but else not. More later on that. Here I've removed 2014. SG claims that the adjustment turns the downtrend raw R1 (blue) into the uptrend SG (purple). I think the right comparison is with F1 (red). It actually doesn't make a big difference in the midrange, where there is little missing data. But at the ends it does, and SG exaggerates the uptrend produced by adjustment. Those are absolute plots. Next I'll subtract R1 from F1 and SG, and also show the difference curve. We agree that R1 is the right measure of "raw". The green SG-R1 was the original spike plot shown at WUWT. The blue F1-R1 was my corrected version. Again you can see that they track mid-range, but diverge near the ends, giving SG-R1 a much greater range. The red curve is the extra bit that he has included. You can see that the difference generates the spike. The reason is that in F2-F1, April has a lot more missing raw values than other months. So F1 is a much more wintry set of data than F2. 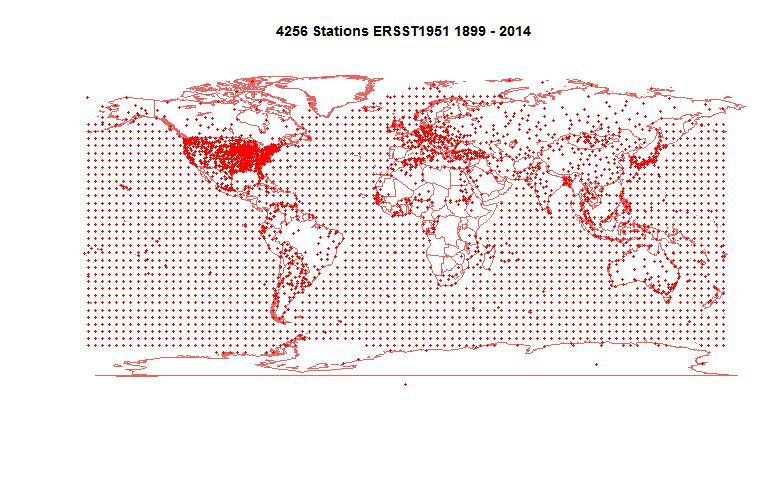 It shows that almost all the introduced term F2-F1 is accounted for by the variation in the climatology - ie different kinds of stations reporting for each month. Between months matters more than between stations, because of seasonality which is a systematic shift for all stations. The green curve is what you get after multiplying by q, and would be the same for q*(F2-F1). But that is exactly the difference between SG's curve and mine. And it shows clearly the 2014 spike, which is entirely predictable from knowing average (not 2014) temperatures only. As mentioned above, SG has an updated method. He gets the annual average by averaging the data for each month first, and then by year. You might think that shouldn't matter, and the fact that it does is a bad sign. It makes little difference to F1-R1, the correct measure. But it does to the added F2-F1. Again the green curve is what is added, and has smaller scatter, so when added to F1-R1 it makes less difference (still some spike, though). But again, it's almost exactly what you get calculated by climatology. It adds no information about temperatures, nor adjustments. It's just error. I've spent a lot of time on this case because I think it helps get thinking on averages straightened out. It helped me. I also think it's worth getting the calculation of the effect of adjustments right. There are effects, and they do have in total an uptrend effect. That's the way it is. But there is no need to bewail the way it isn't. I'll write more on averaging and temperature indices. It was the basic issue that Cowtan and Way found with HADCRUt 4. The issues are non-trivial. 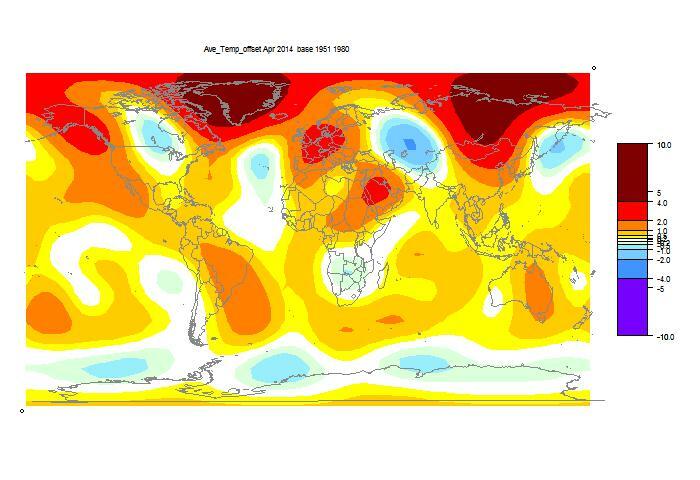 GISS has posted its April estimate for global temperature anomaly, and like TempLS it showed a small change, rising from 0.70°C in February to 0.73°C in April. That's getting quite high. It shows the same cool in N Central N America, and central Asia and rather warmer in E Asia. It doesn't show the TempLS warmth in Greenland, which as I warned was likely an artefact of the lack of readings there..
0.619°C. The satellite indices showed little movement. Still cold in Great lakes and N, and Central Asia. Warm in W Europe. The warmth in Greenland may be exaggerated by the removal of suspect station data.
" The one thing common to all of it though is that it cools the past, and many people don’t see that as a justifiable or even an honest adjustment." I've previously written in defence of TOBS, as an adjustment which is not only justifiable but necessary. The information requiring it is staring analysts in the face, and they would be negligent to ignore it. 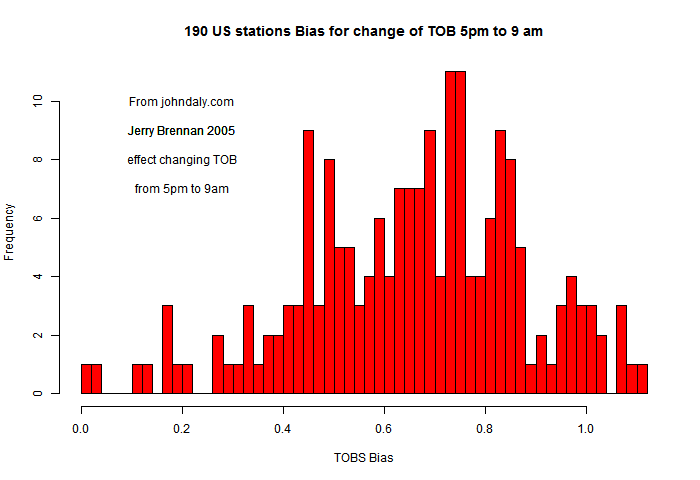 I showed a hourly analysis at Ft Collins, Colo, of the effect of the TOBS bias. But recently, Steven Mosher reminded that the much-loved (by sceptics) John Daly site had posted a much more comprehensive survey, by Jerry Brennan in November 2005. The analysis is here, and his summary datafile, which I will use, is here (text, 29kb), which also identifies the stations. There are other extensive results files there too, but unfortunately, it's all a jumble of numbers. AFAIK, no graphics. So I thought I would provide some. 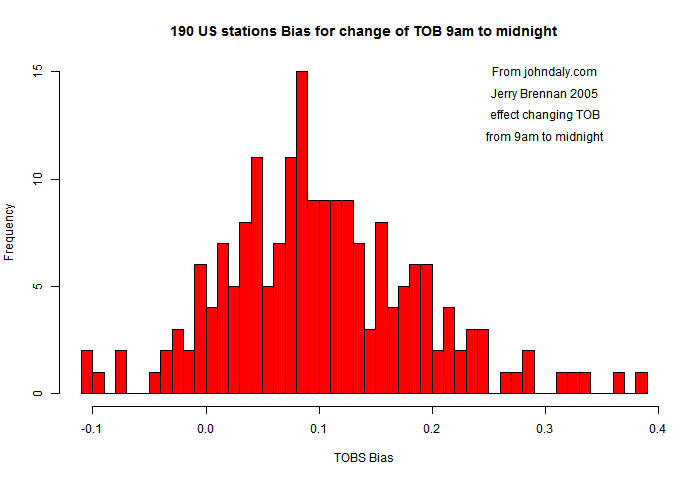 Below is a histogram of the effect of changing TOB from 5pm to 9am for each of the 190 stations considered by Jerry, and of subsequent changes to midnight (standard). 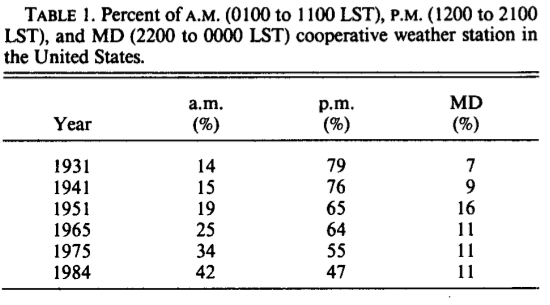 There is also a table from the original paper by Karl et el, 1986, which showed that over the years in the US, about 30% of stations made such a change to 1986. Many more stations would have changed to effectively midnight reporting when MMTS came in. Ther mean effect of the change is 0.66°C cooling. 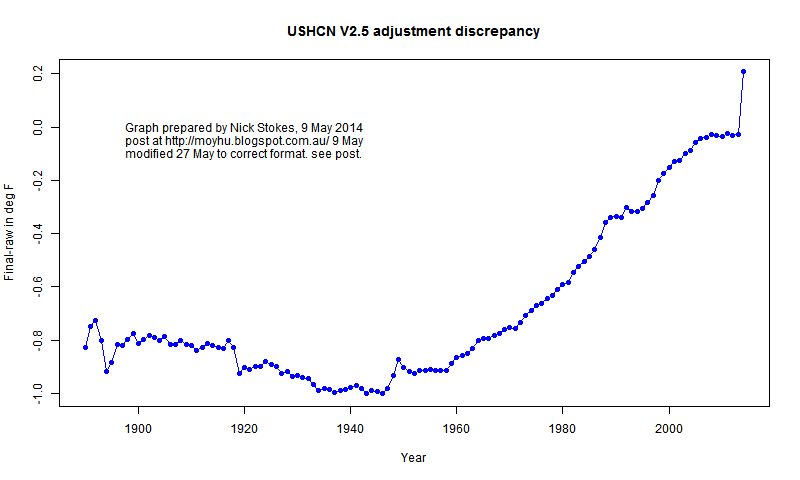 It is no surprise that USHCN adjustments have the effect of "cooling the past". Because evening TOB has a warm bias, through double counting very warm afternoons, the change to 9am has a cooling effect. 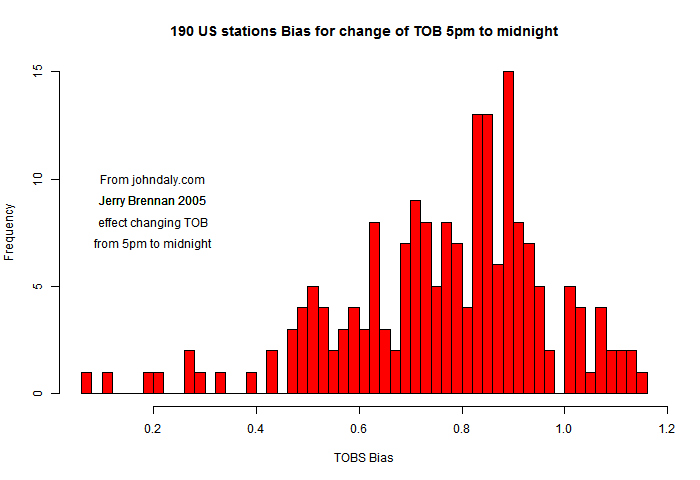 Here is a histogram of the putative effects for the 190 stations of changing from 5pm observing time to 9am. Positive effect indicates (in °C) the bias that has to be subtracted from temperatures before the change. These are large changes, which don't of course apply in full to all stations. A small number were already using midnight. The rest will mostly need some kind of TOBS adjustment, which will "cool the past". But on the evidence, there's no choice. …adjustments to the temperature record are increasing – dramatically. The present is getting warmer, the past is getting cooler, and it has nothing to do with real temperature data – only adjustments to temperature data. The climate reality our government is living in is little more than a self-serving construct." 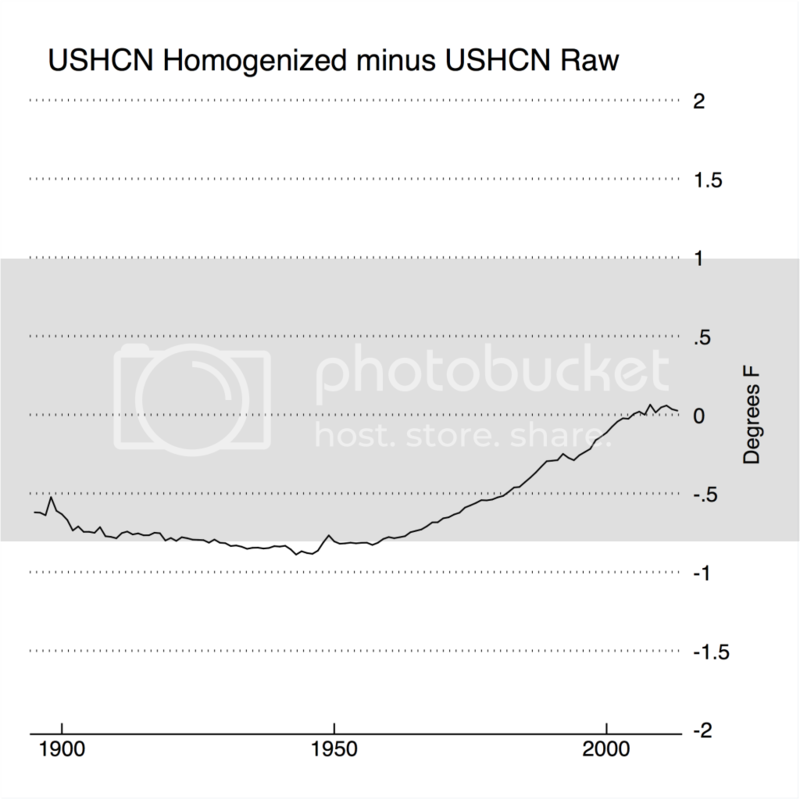 The text gave no source, but linked to this USHCN document, which had no such graph. However, it did say you could click for the source, and that led you to this post from Steven Goddard's site. The title looks rather official, but he did not give the source. But you can see from comments below that he made it himself. And he doesn't give much detail. He did in a comment link to two tar files of data, on his site. So I downloaded them. They are standard USHCN files of station monthly averages, raw and initial. with much more modest changes, and since it's mostly TOBS, such a different version seemed unlikely. Update. Zeke points out in a comment below that the files Steven Goddard supplied were in °C, not °F. Since SG had quoted his results in °F, I assumed that was the form of the data - there was no other indication. I've fixed the plot, sticking with °F. A commenter, Peter O'Neill, who checked my code, noted perceptively that I had made a mistake on data reading. I allowed four places for a monthly temp, which is OK between -9 and 99, but for -10 or less loses the sign. My mistake was actually in thinking the data was in deg F, so -10 would be unlikely for a CONUS month average, tho apparently not impossible. So I've fixed it as he suggested. Mainly, the result is a lot smoother. The format error only hurt badly when final and raw were on opposite sides of -10, which is rare and makes a jumpy result. So the first four months of 2014 gets the positive part. Pretty different. Note the y axis. I just subtracted raw from initial, for all months where both were available, and did an unweighted average over months and stations. That is what Steven Goddard said he did. Personally, I would at least have done by state, and then perhaps with area weighting, But it probably wouldn't make much difference. 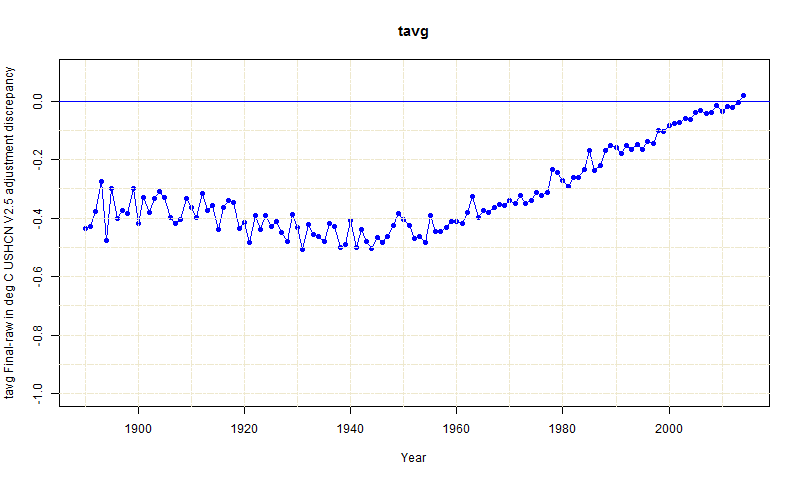 I suggested here that the problem is that SG subtracted the annual average of the final readings from the average of the raw. Zeke, who has the code, has confirmed. But while the final data generally has no missing data, because of FILNET, the raw data has many missing station/months. So the difference of averages of two different populations is formed, and the data, being absolute temperatures, is very heterogeneous. Spatially, but even worse, seasonally. The spike is clear evidence of the problem. SG got one here, too, in Illinois. It is inevitable. In 2014, the final set has 1218 values in each of the first four months. Every station. But for raw, there were, respectively, 891,883,883, and 645 for April. A big preponderance of winter month readings in the average. So the raw is cooler than final for that reason, not adjustments. Update: Some commenters have kindly contributed their own plots. I've appended these at the end. Here is my R code. The contents of the tar files are in my directories "raw" and "final". Here is Zeke's current version of the difference plot. He's using some gridding, which I think is better, but doesn't make a lot of difference (a bit smoother). 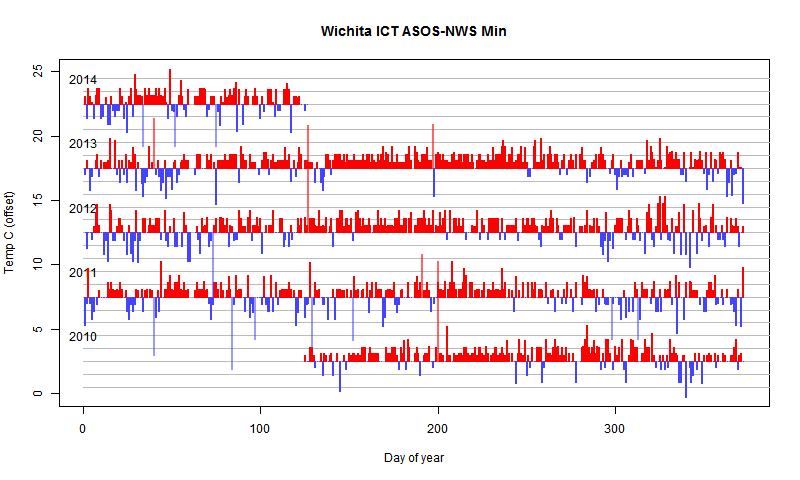 I got involved in a discussion at WUWT about recent unusually early high temperatures in S Kansas, and particularly a reading May 5 of 102°F at Wichita. The WUWT contention was that this and other high temperatures could be ignored because they were measured at airports. 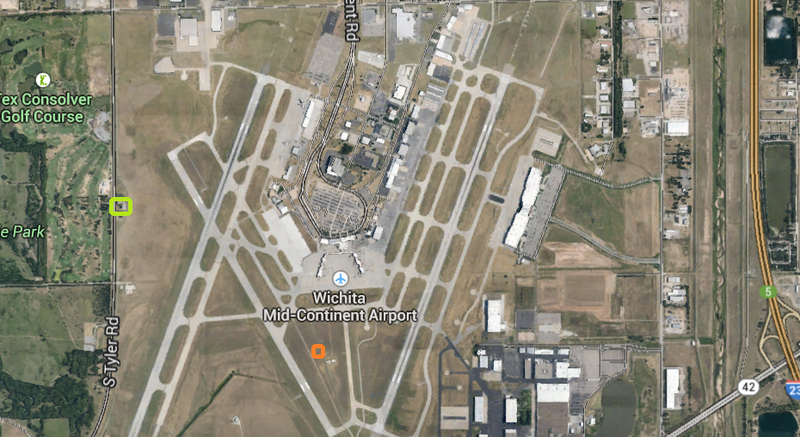 But there were other NWS Coop readings not at airports, and I drew attention to one, WWXK1, that reported 101°F, and was on the airport land, but a mile from the Wichita ASOS site, and away from airport activity in grassy land. It also turns out to be a well-equipped NWS site. At WUWT there were objections to a path, parking not too far away. But still, it's open land around, with a not major road and extensive parkland opposite, and I do tend to think the NWS knows what they are doing. It seems a modern enough site (photo below). So I thought the corroboration of the Airport measure was significant. Anyway, aside from the immediate issue, I thought this conjunction of sites gave a good opportunity to test in local detail how airport siting might affect temperature measurement. They are only a mile apart on flat grassy land, so if it were not for airport perturbations, one might expect temperatures to be very close. So I downloaded the GHCN daily unadjusted TMAX and TMIN data. The airport (KICT) code is USW00003928 and the NWS is USC00148847. My first disappointment was that the NWS record starts in May 2010. If anyone knows where to find more, I'd be glad of a pointer, because the site doesn't look that new. So I can't get a trend difference, but mainly I'm interested in just what kind of day to day differences are observed. I'll show below plots of those differences. The upshot is that the airport site averages about 0.4°C higher on both TMAX and TMIN. Of course any two apparently similar sites separated by a mile might show such a difference. But it is interesting to see how they track. The official airport ASOS thermometer is in the orange ring, and the NWS site is in the light green. The ASOS site is where the usually quoted Wichita temperatures come from. The airport is on the western edge of the city, with just one recent suburb further west from the km wide park across from the NWS. I have to say it doesn't look too bad to me. But let's see. 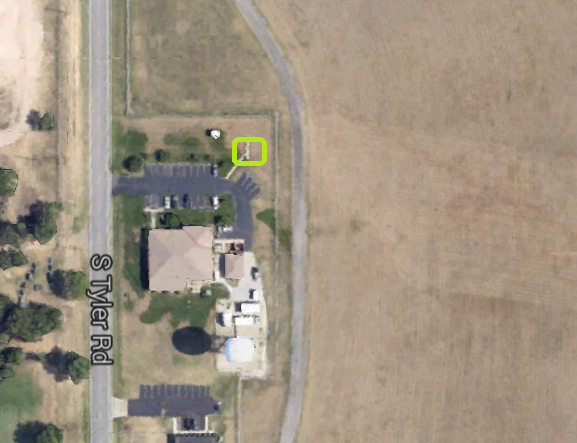 Here is a closer view of the NWS site. I think the MMTS instrument is about in the middle of the green ring. which shows the various instrumentation nicely. you can read criticism of the site here and below. It turns out that they track each other well, so for a general view of the yearly cycle, I'll show just the ASOS site for 2012-3. I show Oct-Sep so you can see a whole summer and a winter. Months are marked in colors to distinguish. 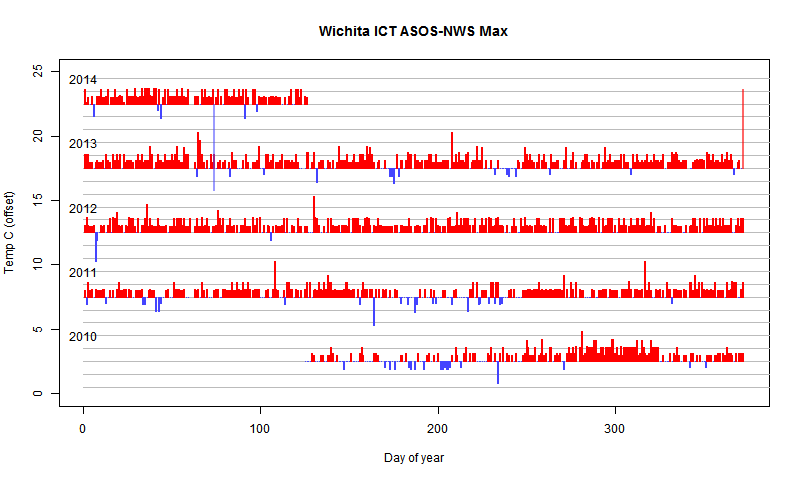 OK, now here is the plot of differences (ASOS-NWS) for TMAX for each day of the five part years. Light grey lines show 1°C intervals - I've put temperatures on the y axis to quantify the scale, but each year is offset. Red means the airport ASOS is higher, and you'll see that it is indeed. I've marked large deviations in a transparent color when they overlap the adjacent year. The values are quantised, reflecting readings in whole °F. There are some large spikes, which I think are some kind of error. For example, on March 12, the ASOS showed 15.0°C, and the NWS site 21.7. Both agree the adjacent days were 21-22°C, and the minima were similar, at about 0°C. So I first thought the ASOS might be wrong, although the NWS max was a repeat of the previous day, which is a little suspicious. To add to the confusion, Tutiempo gives rather different readings, with a dip to 14.4°C on 12th. But Tutiempo also has a similar dip at another Wichita airport (JABARA).So I think on balance the error if any is at NWS. One would expect fewer errors at ASOS. Some other such deviations I looked at also looked like glitches at NWS. Here is the corresponding plot of daily minima. There are similar spikes, again I think mainly glitches at NWS. But there is now also some seasonal variation, with the ASOS often colder in winter. The airport ASOS site is consistently warmer than its grassy neighbour, but only by about 0.4°C. With just one case, one can't definitely attribute that to airport effect. The winter reversal of minima is interesting, but aside from that there doesn't seem to be any pattern.